Unlike other holders which are only 2mm or even 1.5mm, the 5x7 acrylic holder from Elite Display is fully 3mm thick. Why does this matter? It adds heft, durability, and a solid feel to your display, and a sense of gravitas and elegance. 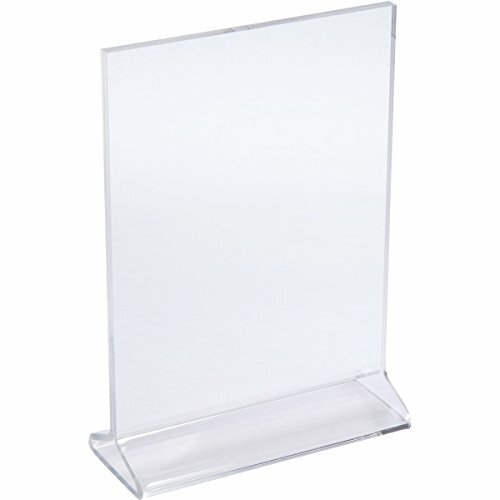 Made from Lucite acrylic (never polystyrene), these menu and photo frames provide superior clarity and will not yellow or turn brittle even when used outdoors. These display stands remain ultra clear and strong for years. Plus they're naturally BPA-free! These displays actually hold a 5x7 menu or photo - no trimming or cutting necessary. ... or you can give your presentation the quality it deserves by selecting a thick, strong, clear, and polished acrylic display - an Elite Display! Impress your guests, increase your sales, enhance your display! If you have any questions about this product by Elite Display USA, contact us by completing and submitting the form below. If you are looking for a specif part number, please include it with your message.